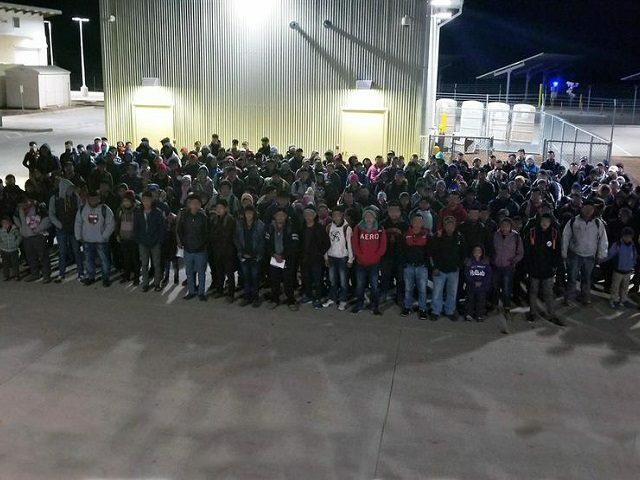 U. S. Border Patrol agents apprehended more than 150,000 migrants who illegally crossed between ports of entry during the first quarter of Fiscal Year 2019. Of those, nearly 100,000 consisted of families and unaccompanied minors. For the third straight month, Border Patrol agents apprehended more than 50,000 migrants who crossed the border between ports of entry in December. During the first quarter of the new fiscal year, agents apprehended a total of 153,609 who illegally crossed the border, according to the December Southwest Border Migration report released Monday morning. The partial government shutdown delayed the release of the December report. The apprehension of the more than 150,000 migrants represents nearly 40 percent of the total number of migrant apprehensions during the entire previous fiscal year. The first quarter apprehensions represent a nearly 84 percent increase over the prior year’s 1st quarter total of 83,568. The apprehension of Family Unit Aliens (FMUA) and Unaccompanied Alien Children (UAC) during the first quarter jumped to 90,807 — an increase of more than 190 percent over the same period last year, the report indicates. Looking at the FMUA apprehensions exclusively (75,794) shows a massive 280 percent increase over the prior year and represents more than 70 percent of the previous year’s entire FMUA apprehensions (107,212). While the Rio Grande Valley Sector continues to see the largest number of FMUA apprehensions of the nine southwestern Border Patrol sectors, the El Paso Sector witnessed a massive 1,602 percent increase over the previous year’s first-quarter numbers, officials reported. Much of this is in the tiny section of the border known as the New Mexico Bootheel. Agents apprehended 1,114 family units in the El Paso Sector during December 2017. In December 2018, that number jumped to 18,957. Six other Border Patrol sectors witnessed triple-digit percentage increases in the apprehension of family units, mostly Central American migrants, who crossed the border illegally in December 2018. Those sectors are: San Diego (667 percent), Del Rio (330 percent), El Centro (310 percent), Tucson (244 percent), Rio Grande Valley (178 percent), and Yuma (174 percent). The Laredo Sector only saw a 72 percent increase over the previous December and the Big Bend Sector actually saw a 50 percent decrease over the prior year. Of the 75,794 migrant families apprehended during the first quarter of the fiscal year came to the U.S. mainly from Guatemala (38430), Honduras (27,180). and El Salvador (7,283). The families from these countries (72,893) represented 96 percent of all family units apprehended along the southwest border between ports of entry. Editor’s Note: This article has been updated with additional comments from Jessica Vaughan, director of policy studies for the Center for Immigration Reform.